[c.1975]. Original artwork in pen-and-ink and watercolour (29 × 41 cm). Presented in limed wax ash frame, with conservation glass and museum mount (framed size 46 × 56.5 cm). In fine condition. 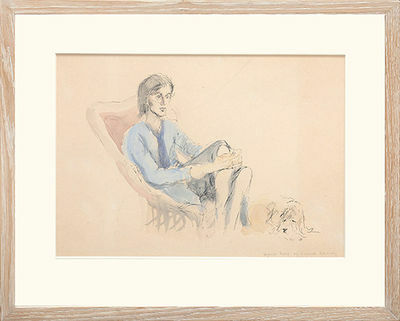 Original portrait of Virginia Woolf, titled and signed by the artist lower right in pencil. It features Woolf reclining in a wicker chair, with her cocker spaniel, Pinka, at her feet. The artist, Richard Pitt Kennedy (19101989), was apprenticed to Leonard Woolf at the embryonic Hogarth Press in the 1920s, starting at the age of 16 after he left school without completing his education. Kennedy was fired after five years at the Press when he "unwittingly" instructed the wrong size of paper to be cut for the Uniform Edition of Virginia Woolf's works. Kennedy writes in his memoir, "LW says I can't be trusted to do anything but wrap up parcels and that I am the most frightful idiot he has ever had the privilege of meeting in a long career of suffering fools" (2011, p. 82). Following his dismissal, he went on to enroll in a journalism course at University College, London (the usual qualifications were waived owing to his experience at the Hogarth Press). His illustrated memoir, A Boy at the Hogarth Press, was published in 1972.